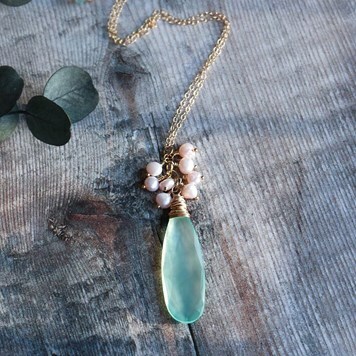 14k rose gold filled, fuchsia and aqua chalcedony lariat necklace from Carolyn's 'Flower & Rain' collection. 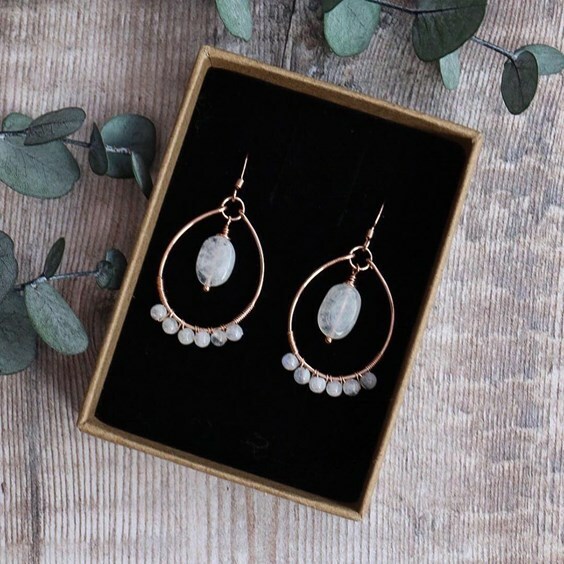 We're thrilled to chat to Carolyn, a talented jeweller who uses wire and gemstone beads to create beautiful handmade designs at her home studio in Uttoxeter. 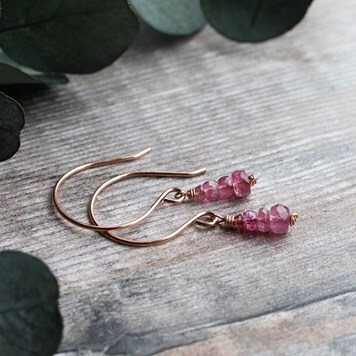 Beading is such a wonderful hobby and gives you the chance to experiment with all kinds of designs using wire-wrapping techniques, different metals, findings and gemstone beads. The possibilities are endless! You can browse our range of gemstone beads here. 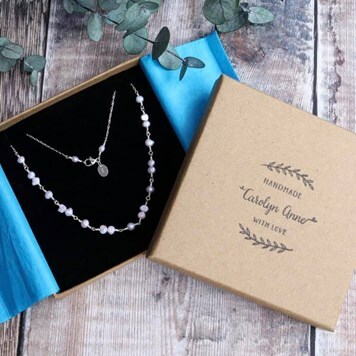 Discovering jewellery making in 2018, Carolyn has grown an impressive business and following but it's no surprise due to her eye for detail and beautiful gemstone combinations. 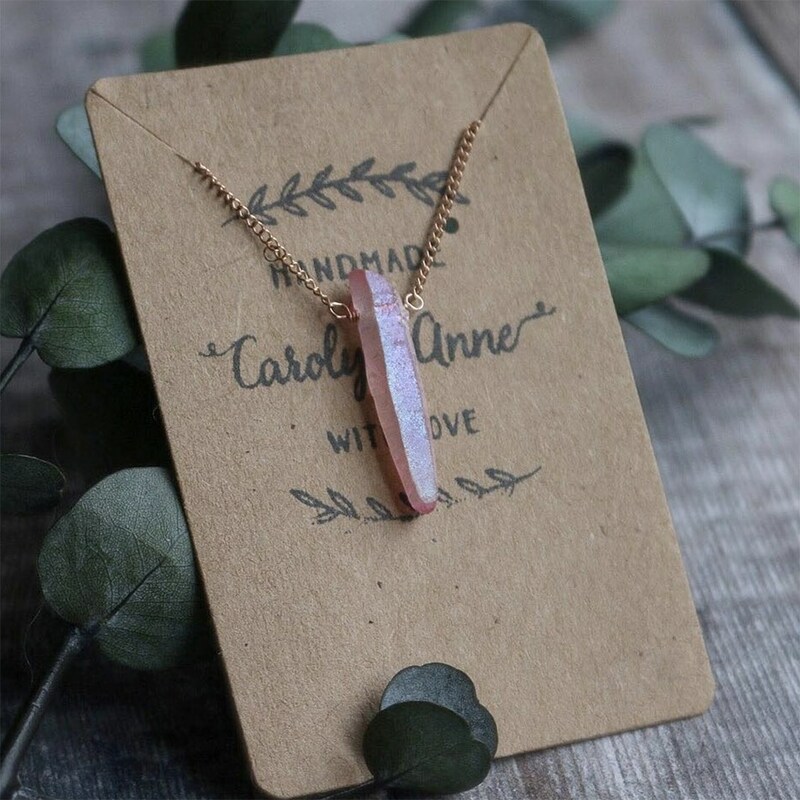 We chat to Carolyn all about how her jewellery making journey began, her recommended beading tools and you even get to meet her studio assistant! Hi Carolyn, tell us about your handmade jewellery business and how it all started! Hi! Thank you so much for inviting me. It started in June 2018, when a work colleague showed me some of the jewellery she’d made. I was looking for a new hobby at the time as my life was all about work and study (I’m studying Forensic Psychology with the Open University) and needed something that was totally different and would help me relax. I started with glass beads but after researching different materials my work quickly evolved to using gemstones and fine metals exclusively. In August 2018 I set up my little Etsy shop. 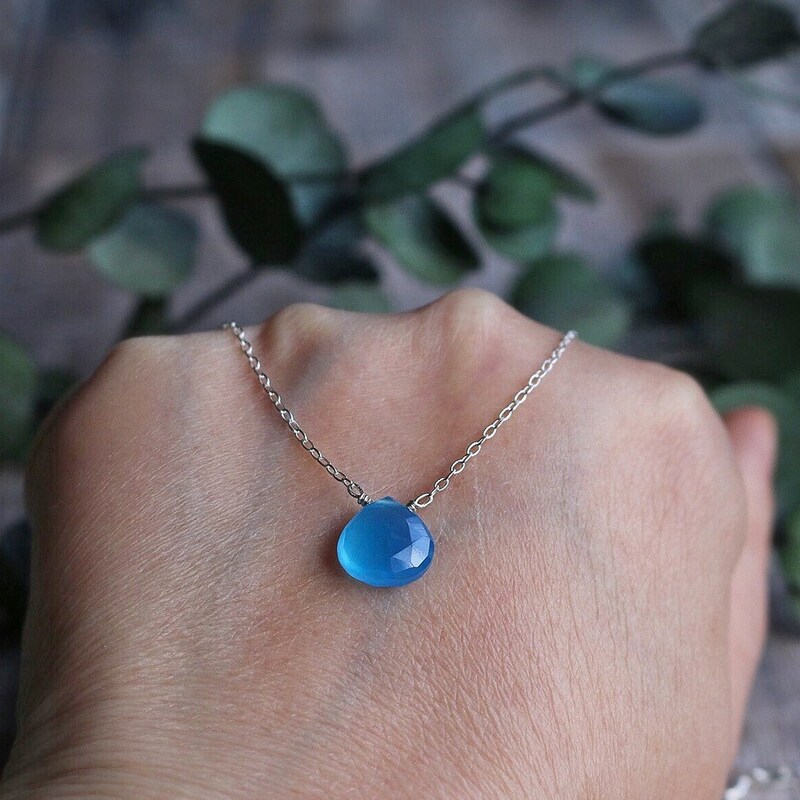 There’s nothing quite like someone wanting to purchase a piece of jewellery you’ve made with your own two hands. It’s very rewarding. 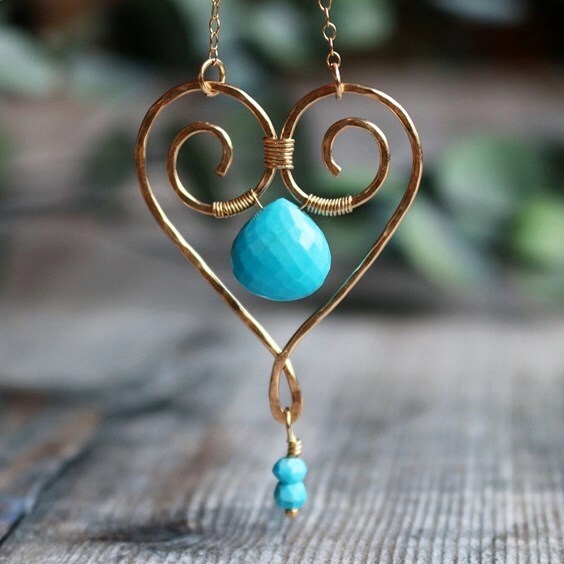 Beautiful 14k gold filled handcrafted heart pendant with gorgeous blue turquoise beads and briolette. Rainbow moonstone beads hand wired to hand crafted loops and ear wires. Are you a self-taught jeweller? Yes, although you could say YouTube was my tutor! I spent a lot of time researching different methods and this is when I started to really love using wire in my designs. 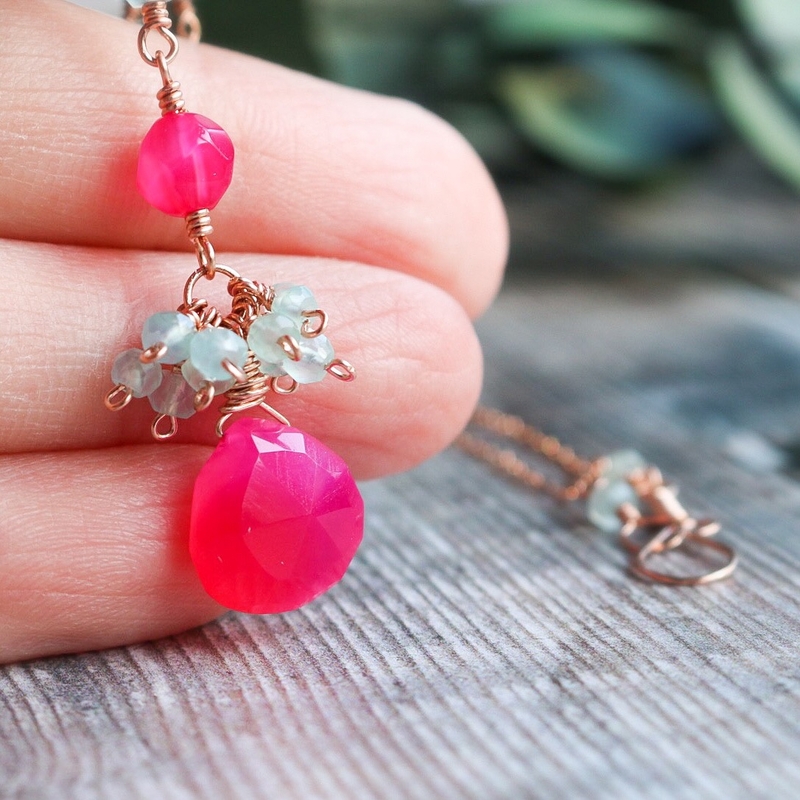 What is your favourite thing about working with gemstone beads and wire? I think my favourite thing about using wire is that I can make every aspect of a piece of jewellery; my own chains, clasps, ear wires. It’s such a fun process and the finished piece is completely handcrafted, which is such a lovely feeling, you really feel as though you have achieved something. 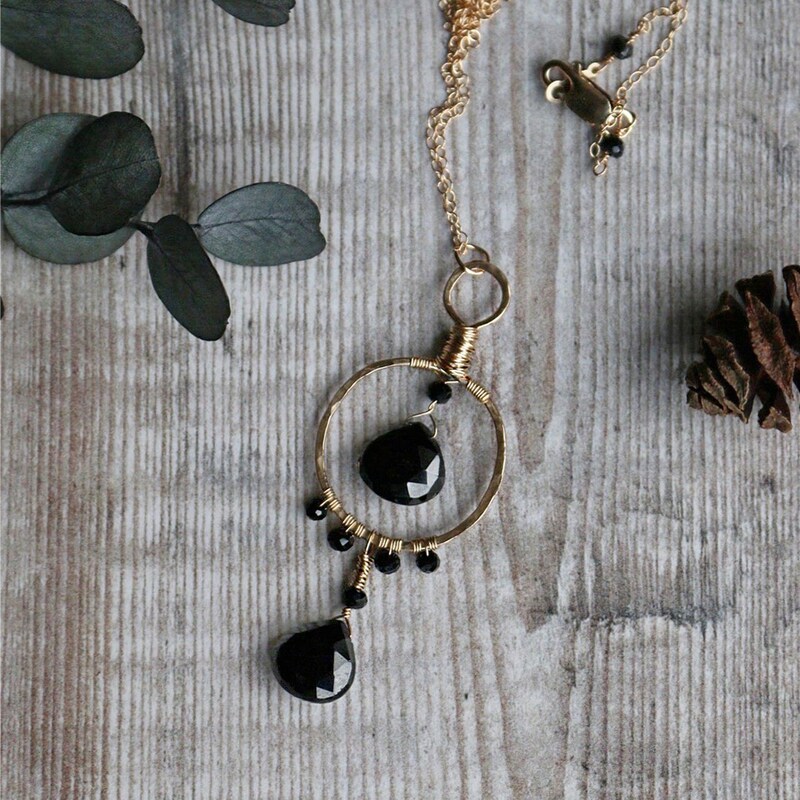 To then combine this with the beauty of gemstones – it’s just so exciting. I have a huge gemstone addiction. Tell us about your workspace! I wanted my little workshop to be a relaxing space, somewhere I would feel comfortable and love spending time. It’s very light and serene, with gentle pastel accents. I desperately wanted it to be a tidy space, but I’ve come to accept that I’m not a tidy jewellery maker. I love having all the different wires and gems around me. Although it looks a complete mess to the outsider, to me it’s my happy place. 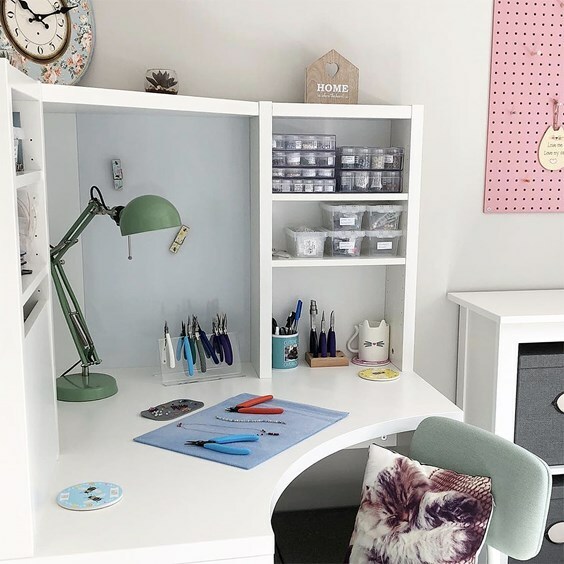 Find more workspace inspiration and top tips for setting up your jewellery workshop here. "Custom made sterling silver pearl necklace on its way to its new home. Hope they love it as much as I enjoyed making it." 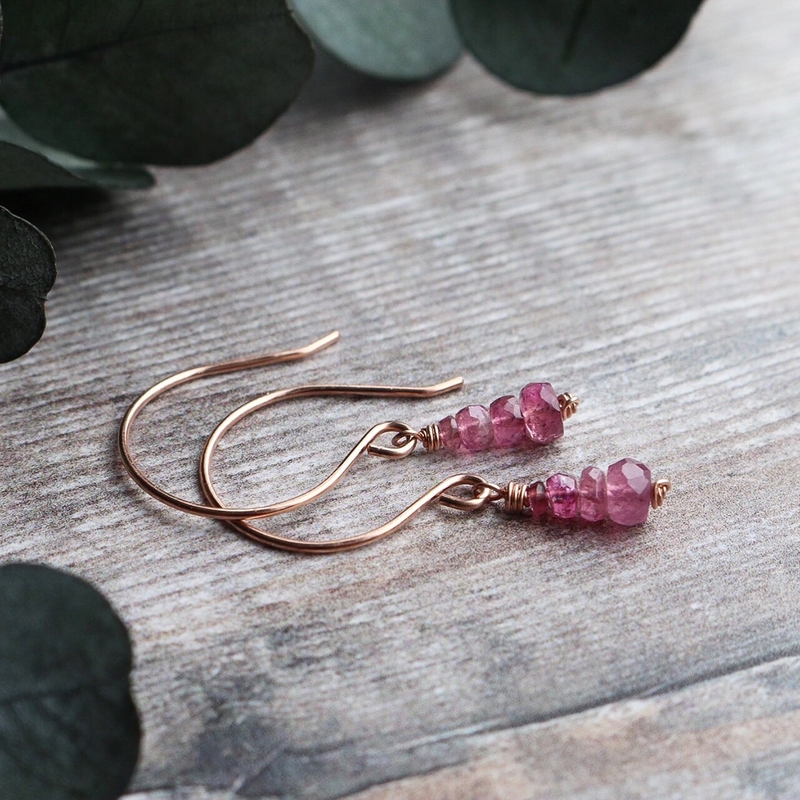 Pink tourmaline gemstones suspended from rose gold filled ear wires. "I am in love with these gorgeous juicy plump blue chalcedony heart briolettes from Kernowcraft"
This is a tough one – I think both have a place in my jewellery. They both offer something different. What are your essential beading tools? I would say my essential tools are my fine round nose pliers, Xuron tweezer-nose pliers and flush cutters, and my bail making pliers, which I use to form my ear wires and clasps. I’m always on the lookout for even finer round and chain nose pliers (also known as snipe nose pliers), as I like most of my wire jewellery to be quite delicate and dainty. We love your packaging, tell us more about the design process! Thank you! My packaging has evolved over the last few months and I’m sure it will continue to evolve but my main objective is to combine gorgeous aesthetics with eco-friendly materials. 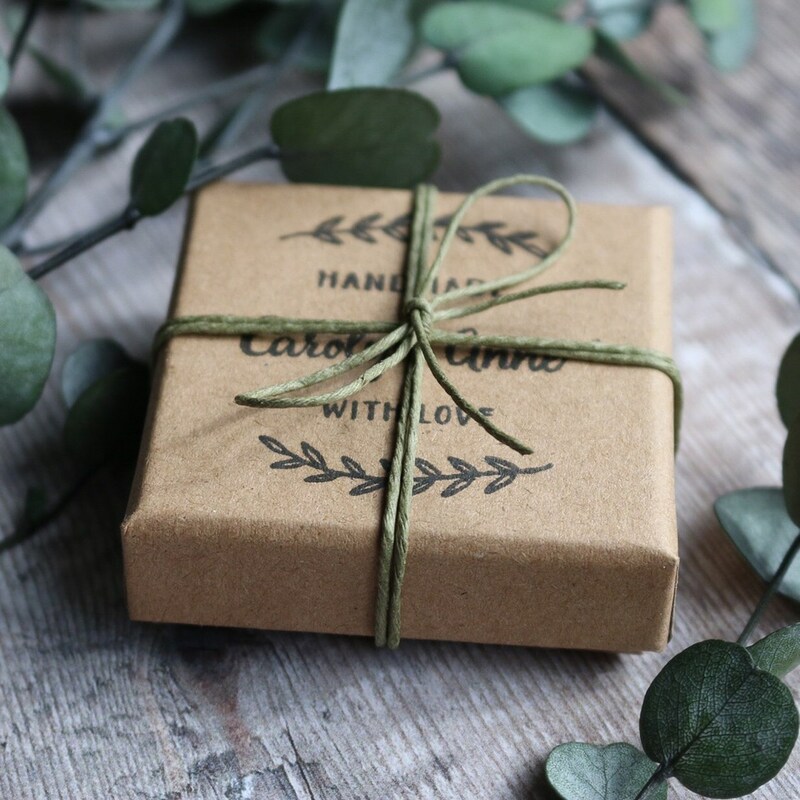 It’s very important to me that my packaging is beautiful and makes my customers feel very special when they receive my jewellery but it’s also very important to me that the material’s I use are not harmful to the environment. I would like every part of my packaging to be from 100% recycled material that can be 100% recyclable. I think I’m at around 80%. It’s difficult to combine these two aspects but I’m always researching new materials and companies so I hope over time I will achieve my goal. Tell us about your studio assistant, Bumble! Hehe! Bumble is my gorgeous cat who was meant to be a British Shorthair but, as you can see, came out a bit wrong with his luscious long locks! 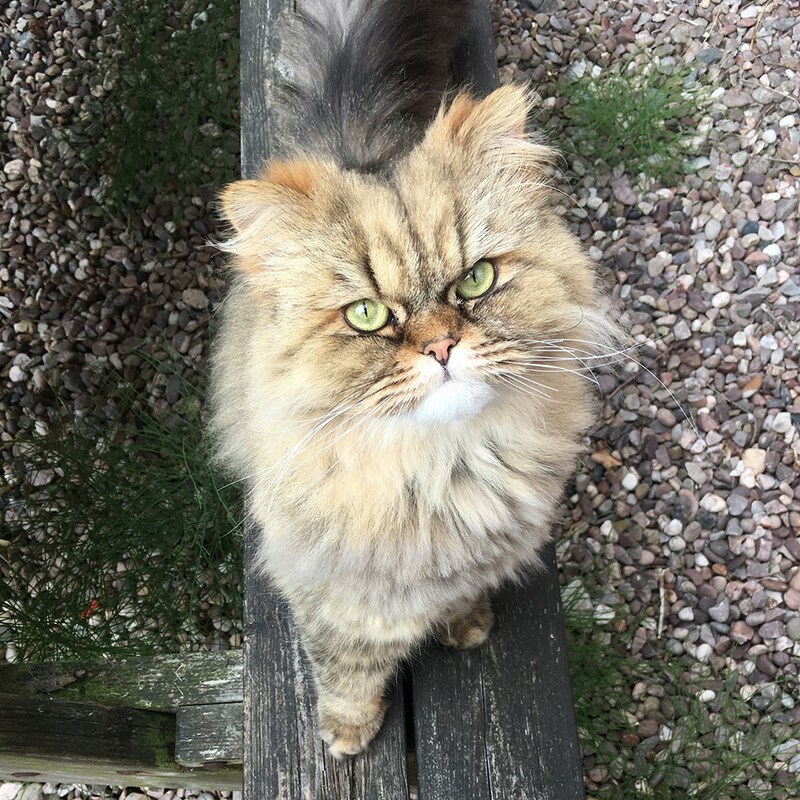 He constantly assists me in my jewellery making process and he especially loves to sort the gemstones and wire – one day he was feeling particularly helpful and jumped up onto my worktop, tipping all my findings onto the floor. Your photography is beautiful, what are your top tips? Thank you so much! I’ve always loved photography and carry a camera with me where ever I go. However, product photography has been a new skill that I’ve had to learn and which I still haven’t mastered by any means, but I’ve really enjoyed the process. My three top tips would be: always use natural light if possible as I think it gives the best and most beautiful affect to whatever is being photographed; try not to use filters such as those found on Instagram – it’s ok to tweak with editing tools but to me filters take away the natural beauty of the jewellery; keep backgrounds simple, anything too patterned can detract from whatever is being photographed. Read more about photography tips for jewellery here. 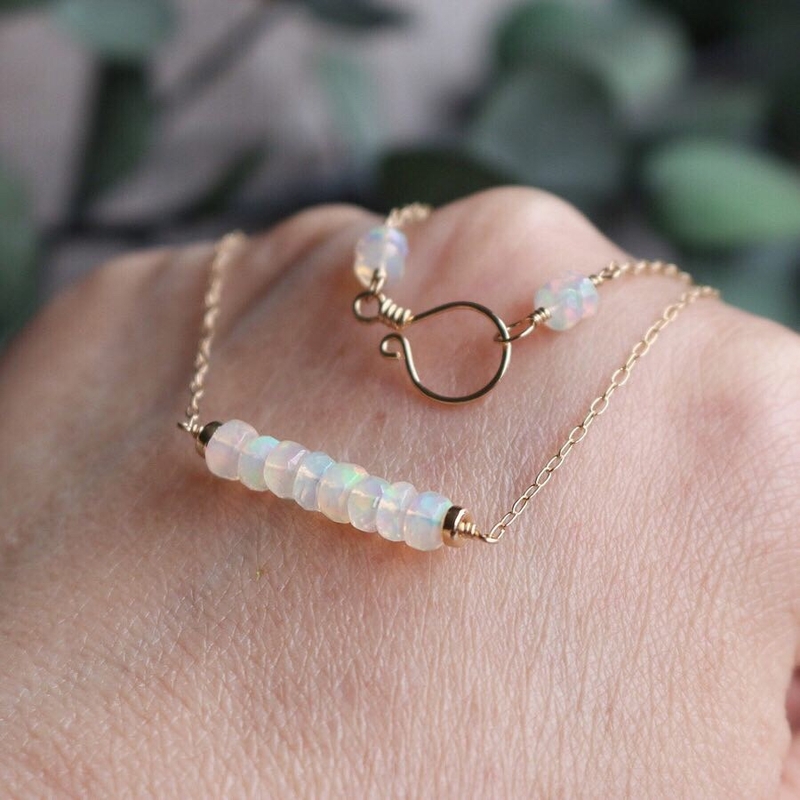 Beautiful AAA faceted Ethiopian Welo opal rondelle beads hand wired to a dainty but strong 14k gold filled 16” chain. Explore Kernowcraft's opal gemstones here. Oh wow, there are so many to choose from… ok, I would say chalcedony, moonstone and Ethiopian opals. What’s one technique you’d like to try/master and why? I would love to try silversmithing as it looks fun. Do you enjoy any other creative hobbies? I love reading, photography and hiking. Not all creative but still fun! What’s something you wish you knew before setting up your business? Gorgeous 14k gold filled necklace with a large chalcedony drop with soft pink pearls. A sweet pink matte Aura Quartz point hand wired to a 14k rose gold filled chain. Shop Kernowcraft's crystals here. 14k gold filled pendant necklace with black spinel. What are your favourite Kernowcraft products? 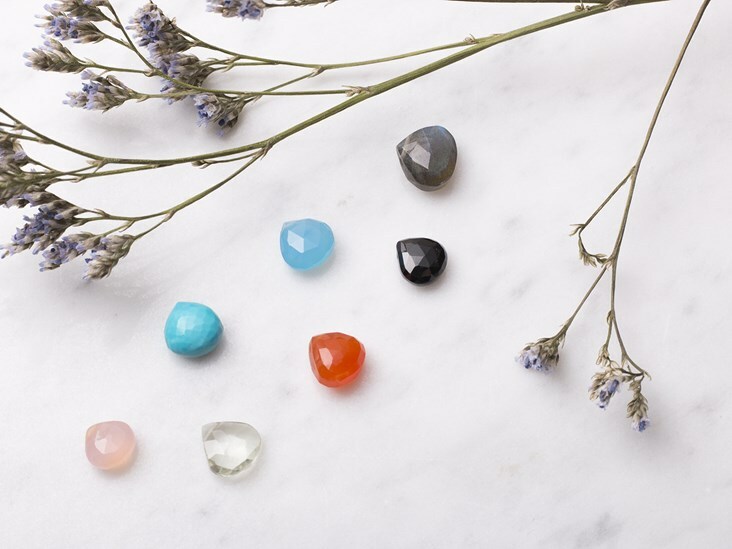 I mainly use Kernowcraft for the gorgeous gemstones and I would definitely recommend the single briolette beads, especially the chalcedony in aqua, blue and pink, rose quartz and turquoise. All are beautiful and great quality. Click here for jewellery making kits for ideas, with many featuring Kernowcraft's beautiful briolettes!